Prelude to the 4th. On Sunday, July 3, the Aurora Theatre will present a free performance of The Little Mermaid on the Lawrenceville Lawn (210 Luckie St). The show starts at 7:00 p.m., and a fireworks display will take place after the performance. Legendary 4th at Lenox Square Mall. Monday, July 4. There’ll be live musical entertainment by Sons of Sailors and Party on the Moon on the mall’s outdoor main stage starting at 6:00 p.m., and the fireworks display starts at 9:40 p.m.
4th of July Celebration at Centennial Park. Monday, July 4. There’ll be live music by Montell Jordan and J-Fly and Friends followed by a fireworks display at dark. Gates open at 6 p.m.
Pied Piper Parade, Concert & Fireworks on the 4th. Monday, July 4. Decatur’s 4th of July Pied Piper parade sounds like fun. The parade starts at 6:00 p.m. and winds its way through downtown Decatur. The Callanwolde Concert Band performs at 7:00 p.m. at the Community Bandstand, and the fireworks display starts at approximately 9:00 p.m. Mall of Georgia’s Star-Spangled Fourth on Monday, July 4. Starting at 5:00 p.m., there’ll be live music w , and a Kid Zone. The fireworks show starts at 9:35 p.m., and there’ll be a post-fireworks screening of Hunger Games: Mockingjay Part 2. July 4th Festivities and Fireworks at Wills Park in Alpharetta. Monday, July 4. From 6:00 p.m.-9:00 p.m., there’ll be children’s activities on the lawn behind Alpharetta Community Center, live music plus fireworks display at dusk. July 4th on the Marietta Square. Monday, July 4. The Marietta Freedom Parade steps off at 10:00 a.m. Following the parade, stick around for a Fourth of July Festival, featuring an arts & crafts show, live music, & fireworks beginning at dusk. Dunwoody 4th of July Parade. The parade steps off at 9:00 a.m. on Monday, July 4, at the intersection of Mount Vernon Road and Jett Ferry Road and marches down Mount Vernon Road to Dunwoody Village. Fantastic Fourth Celebration at Stone Mountain Park. July 1-4. 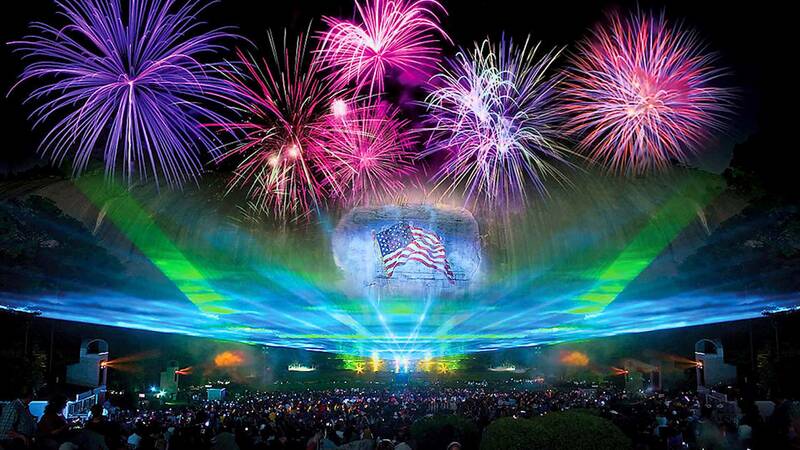 There’ll be fireworks & the all-new Lasershow Spectacular each evening. The lasershow is free but there is a $15 parking fee.